and you can choose one earbud as a main control button, for example, choose the Right earbud as the main control button. Now press twice on the Right earbud button (chosen main button). About 5s, the left earbud's indicator light disappears, only the right earbud's indicator flash red and blue alternatively. This is a process of pairing the left earbud and the right earbud. then the right earbud's indicator light disappears. Connect successful, now you can enjoy your music. If you want to turn off the earbuds, it is easy to operate, just press either the Left earbud or the Right earbud button about 5s until you see the indicator flashes red, then both earbuds are turned off. Now want to turn on the two earbuds again? then both earbuds are turned on and they will be connected to your device automatically. Now open the music, you can share attractive music with Intcrown Bluetooth earbuds. 1.The pairing of left and right earbuds and the pairing of earbuds and your device only need to be done once. Then the next time they can be connected automatically after turning on. 2.Please keep in mind, once paired, the two earbuds should be turn off or turn on at the same time, then the automatic connection will be supported. True Wireless Design: If you're tired of regular headphone's wire always entangled and messy, true wireless design is a nice choice for you. Adopted true wireless technology, Intcrown wireless earbuds have achieved to free your ears from limitation of wired headphones, and you won't need to tolerate tangled wires anymore. Ergonomic design gives your ears a comfortable and stable experience. HD Sound Quality: HD rendering technology generates incredible sound quality and stable connectivity, and it is recommendable for your ear safety. Intcrown wireless earbuds offer a truly natural and authentic sound performance no matter in calls or listening to music. What's important, it can block out lots of noises. Charging and Storage Box: A large capacity lithium battery with 500mAh is designed together with the special storage box, which supports 4 times quick charging for your earbuds at any time. It supports 3 hours music time on full charge condition. With the special charging box, the earbuds would last up to 15 hours for you enjoying music or movies. Ultra Mini Size: Intcrown wireless earbuds have ultra mini size and lightweight, so it can be carried out either your pocket or bags. 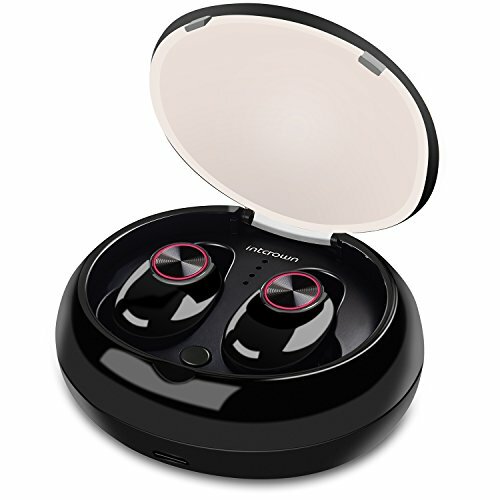 The wireless earbuds can be used dual or separately and you can share music and movies with your family or friends. Bluetooth Version 4.2 provides faster pairing and stable connection. Wireless range up to 10 meters if no obstructions. Wide Compatibility: Intcrown TWS earbuds adopts one button control design, you can control the multifunction button to answer/reject calling, play/pause songs and switch songs. The wireless earbuds are compatible with all Bluetooth-enabled devices, such as iPhone X/8/8 Plus/7/7 Plus and Android devices. 12 months wireless earbuds warranty. If you have any questions about this product by Intcrown, contact us by completing and submitting the form below. If you are looking for a specif part number, please include it with your message.